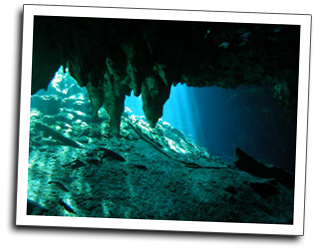 For all certified Open Water divers, the experience of diving the caverns in the Akumal area is just spectacular. Our "Double Underground" package Includes: Two Guided Cavern Dives, Transportation to and from Playa del Carmen, professional guide, refreshments and lunch, tanks, lights, and weights. You take the 8:00am ferry from Cozumel and we meet you in Playa Del Carmen and provide transfers to our resort. We then depart for two amazing cavern dives returning to Villas DeRosa for lunch on the beach. After a relaxing lunch and maybe a cocktail or two, we provide transfers to Playa Del Carmen after a great day of cavern diving.